It’s best to break out the multi-colored windbreaker, gold rope chain, and Kid N’ Play hi-top for this one. High school senior Malcolm (Shameik Moore) is a self-professed, 1990’s hip-hop music/style aficionado school geek, and Harvard University hopeful, making his way in a rough area of Los Angeles along with equally geeky and old-school loving friends Diggy (Kiersey Clemons) and Jib (Tony Revolori). They don’t fit into their school, city, or what society expects of them. And they like it like way. Their everyday scripts end up getting flipped, though, when the trio gets invited to local Dope dealer Dom’s (A$AP Rocky) birthday party. While there, what starts as a fun trek into a world foreign to them ends up with Malcolm in possession of a whole lot of MDMA. No matter how this ends up for he and crew, it is definitely going to be a journey that will teach him a ton about himself. Dope, written and directed by Rick Famuyiwa (The Wood, Brown Sugar), gets its inspiration from classic urban 90’s flicks like Boyz in the Hood, Menace II Society, even House Party. Looking at this through the lens of what came before it, it is easy to think that this isn’t that different from those aforementioned films. Dope is different, or at the very least feels so, as it has been a while since one of these predominately black coming-of-age films has been out to the public. That doesn’t mean that it is as tight as those others, but it is worth a look. Where Dope differs from most of the rest is who, or rather what, is the focus of its attention. Most of these types of movies choose to focus on the gangster lifestyle where everyone is seemingly a gangster or headed down that path, either willingly or unwillingly. Famuyiwa instead chooses to focus on the perception, and not so much the reality, even though the reality is clear. It is tough to describe and probably makes no sense reading that, but long story short, this is a story about refusing to accept what someone should be or how they should act based on their circumstances, skin color, etc. It is also a story about letting your environment shape you but not necessarily make you; however, this theme becomes a bit more fuzzy as the movie goes on. Yours truly knows these thoughts may be all over the place and unorganized, but I’d rather not spoil anything despite finding it somewhat hard to get these thoughts clearer. As addicting as Dope is, the 90’s old school hip-hop tracks surely assisting in that, it is sort of all over the place in what it is trying to achieve. Sure, it is a coming-of-age story, but occasionally it is told as a a satire, sometimes a comedy, other times a brooding drama. In scenes it is possible to get all of these at once, making the film sort of inconsistent in tone (perhaps intentionally? ), which is felt the most during a very odd middle portion that really could have been done without. Seriously, this portion is so out there and bizarre that it really detracts from the film for a good while, and I was afraid that it would be completely downhill from that point. Luckliy, a key plot twist put this right back on schedule. 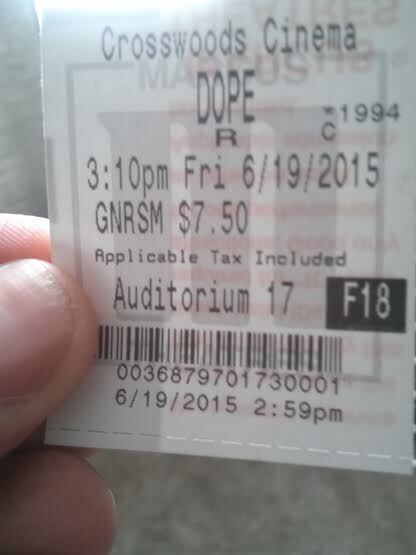 Dope is not laced with great performances. That isn’t to say that any are bad, it is just that when one watches this, it is unlikely that anyone in the cast will blow anyone away. 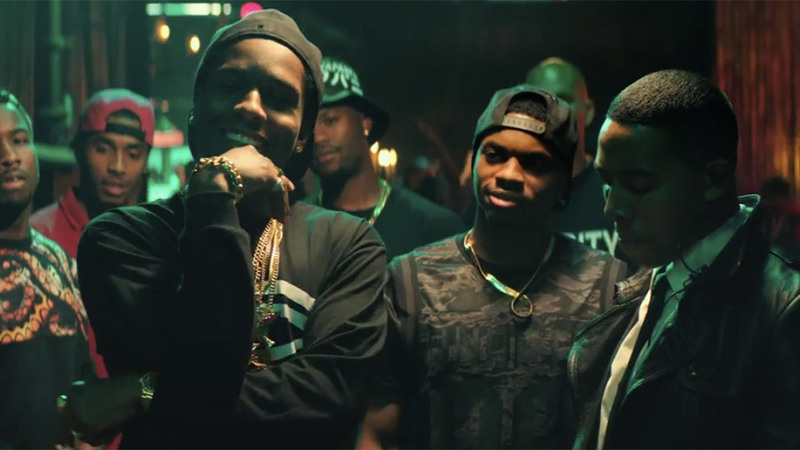 Rappers A$AP Rocky and Tyga do not embarrass themselves in their screentime but it is hard to see them do anything else besides these parts in the future. Zoe Kravitz does supply a strong love interest for the main character. The trio of friends feel like people who would have a strong bond, with the natural teen banter and what not. Veteran Roger Guenveur Smith, an actor who always makes the most of his time in any movie, is a steady hand in a critical role. The man who truly impresses is Shameik Moore as Malcolm. He has a strong screen presence, reminiscent of Derek Luke in both appearance and performance. Here, he’s funny, magnetic, and displays all of the emotions expected with being in a situation such as the one he finds himself in. Hopefully this proves to be a launching pad into bigger things. Dope is a bag of product that doesn’t always produce the consistent desired effect, but it does produce pretty notable highs, and it is a lot different than anything else out right now. It may not be for everyone, but how Boyz in the Hood and Menace II Society are held in high regard as classic 90’s street dramas, Dope may be the 2010’s version of those in a modern setting. Photo credits go to highsnobiety.con, yahoo.com, and complex.com. Saw it yesterday. Loved the first act but thought it went downhill from there. Solid review, you made a lot of good points. The “environment shape you but not make you” line was great. Thanks man. I feel this write-up was a little all over the place but I tried. I thought about downgrading it for a bit but yeah, that 2nd act feels more done for shock than anything else. Didn’t really fit in to the movie but the twist got me back into it. A fun flick, but also one that has a good message at the center of it. Good review Jackson. It is much different than anything else out now. Ah I remember Kid n’ Play from my childhood. I can’t remember if they were actually funny or not though.